Anxiety is a normal human emotion. It is a feeling of uneasiness in situations that maybe dangerous or threatening. It becomes a disorder when the anxiety interferes with day to day functioning and happiness. When managed effectively there is good evidence this will be of lifelong benefit. 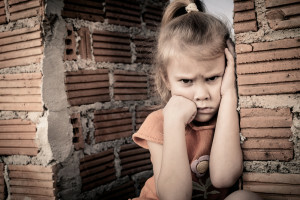 Anxiety is often known as an ‘internalising’ condition which means that the child is ‘bottling up’ his or her emotions and they will find it difficult to communicate how they feel. This ‘pressure cooker’ affect will boil over at times resulting in tantrums, meltdowns, and ‘internal distress’. This article is designed to help parents understand anxiety and how to manage it. What is normal Anxiety ? Anxiety has its place to keeps us safe. For example when crossing a busy road a small amount of anxiety will help us focus and enhances our senses. Infants develop ‘stranger anxiety’ around 7 – 9 months of age. Doctors will see lots of anxious toddlers who become upset during routine examinations. This is a primeval defense mechanism to ‘keep safe’ and not stray far from the parents. As the toddler explores the environment in the immediate vicinity of the parent he or she will repeatedly return for reassurance and then head out again. Psychologists call this the circle of security. Many toddlers will feel anxiety when they start daycare, or kindergarten, and over time this will lessen as they are ‘exposed’ to this positive experience. Moving through the ages, first day of school, talking in front of the class, can all cause anxiety and this is relatively normal as these challenges are successfully negotiated. Anxiety becomes a disorder through either its persistence or intensity. What Causes Anxiety Disorder ? The well developed frontal lobe of the human brain is influenced by genetics and experience. Neurochemicals such as dopamine, noradrenaline and seratonin and their cell receptors are responsible for many human emotions, drives and feelings and help make up our individual personality. Some personalities are relaxed and ‘carefree’ and some are highly strung and ‘anxious’. There is a strong genetic component to anxiety and many parents identify with the anxious child as they may have been similar. Childhood experiences coupled with this genetic susceptibility may increase the propensity to feeling anxious. However these childhood experiences do not necessarily have to be serious or significant. It is the child’s perception – the genetic component – that will be at fault. Experiences lay down thought ‘pathways’ that head in an anxious and negative direction. This is the basis behind how psychology works. These pathways become well worn ways of thinking. For example when told about an upcoming holiday the non anxious child will think of the fun things that will be happening, and will be appropriately excited. The anxious child may worry about things going potentially wrong such as the travel, (what if we crash? ), the food (what if I don’t like it or get sick?) and will feel uncomfortable with the upcoming change. Psychologists try and show children how to change this ‘thinking pathway’. This is called cognitive behaviour therapy and has been shown to be effective. This is not due to ‘bad parenting’. These include separation anxiety, generalised anxiety, social anxiety, phobias and obsessive compulsive disorder. This breakdown is useful for psychologists and psychiatrists and for analysing treatments but in reality children tend to have an over-riding type, but borrow symptoms from the others. This is the most common form of anxiety. The young child will be overly clingy and will take a long time to settle when away from parents. Most children by the age of three can accept the temporary absence of a parent. But with separation anxiety disorder this persists in intensity and frequency. At home the child will follow the parent(s) around the house and require repeated reassurance. During the night independent sleep is difficult or impossible. The older child will similarly be ‘attached’ to a parent, usually the Mother and will worry that something bad will happen to their parents or siblings. School refusal is not uncommon. Stomach aches, headaches are a common complaint and older children may develop panic attacks in certain situations. Is basically as it sounds. Overwhelming unrealistic worries about health, school, their parents, and peers will dominate the child who has generalised anxiety. They will have problems focusing on schoolwork and require extraordinary reassurance. These children can sometimes be overly ‘adult’ and they are ‘perfect’ school students sometimes. At home the parents are exasperated as these children have bottled all their emotions up to ‘soldier on’ during school and at will unleash at home. Teachers are quite surprised to hear the problems the parents are experiencing. These children will often complain of headaches and abdominal pains and ‘feel sick’. Represents avoidance of situations that may result in ridicule or embarrassment. The child is overly shy, thinking ‘what if’ thoughts. This can result in them avoiding exams, or oral presentations and hence detrimentally affect school. This anxiety is also seen in generalised anxiety. However the child with social anxiety only, will have no symptoms when they are with familiar family and peers. In some cases school refusal occurs. The older child with school refusal will most likely have Social anxiety, whereas the younger child will have separation anxiety. This anxiety can occur with generalised anxiety. The obsessions involve unwelcome thoughts or intrusions that can be distressing and may often involve bodily wastes or secretions. The compulsions are the need to perform a particular behaviour to alleviate a self defined anxiety. For example repeated hand washing, checking or repeated touching behaviour. At times of stress (bedtime, preparing for school), some children touch certain objects, say certain words, or wash their hands repeatedly. OCD is diagnosed when the thoughts or rituals cause distress, consume time, or interfere with occupational or social functioning. How do you Diagnose Anxiety Disorder ? When a child has a mental health disorder, they are struggling to function. They find life extremely difficult and challenging and hence the word ‘disorder’. School, home, relationships are difficult and the symptoms mentioned above are prominent. There are some screening tools available for childhood anxiety online. One example is called the SCARED screening tool. There are two questionnaires one for the child to fill out and one for the parent. A formal diagnosis can only be made by a health professional such as a child psychologist, GP who is trained in child health, a paediatrician or a child psychiatrist. These screening tools simply show that further assessment is needed. How to Manage Anxiety Disorder ? Over the last few decades significant progress has been made in the management of mental health disorders due to excellent research. It is well known that when managed correctly anxiety can improve and this lessens the risk of depression and even suicide during adolescence and the later years. On the other hand incorrect management can result in harm if resources and time are spent on treatment or methods that are either delivered incorrectly or are questionable regarding their effectiveness. For instance many over the counter medications will claim to help anxiety symptoms, and apart from the placebo effect there is absolutely no evidence for their efficacy. This is similar for many alternative practices which advertise their effectiveness in treating stress and anxiety without any evidence whatsoever. Having a stable adult, who provides a positive attachment is essential if any treatment is going to be successful. Paediatricians and child mental health experts agree that there is little point in embarking on treatment if those who are responsible have their own mental health issues that impact on the child. Someone who provides safety, a role model, and security needs to be involved to ensure therapy works. Ideally this should extend to a safe positive school and peer environment, and nowadays a safe social media environment. Setting this up can sometimes be all that is required to ensure a child’s anxiety lessens to the point where life and self esteem improves. This may require some difficult decisions. For example a susceptible child may develop severe separation anxiety due to bullying by either peers or a teacher and unless this situation is dealt with there is little point in spending time and money on counselling or other therapies. If there is no agreeable solution then moving the child to another environment maybe all that is needed. Treatment for residual anxiety will be far more effective when the environment is supportive. Finally ensure sleep is adequate and diet is healthy. Caffeine has been found to increase anxiety in some children and eliminating such drinks will help with both sleep and the anxiety. Don’t lecture, nag or repeatedly engage the child. This is easier said than done and sometimes it is worth getting professional advice. Consequences and time out are important and should be immediate and also redeemable and refundable. 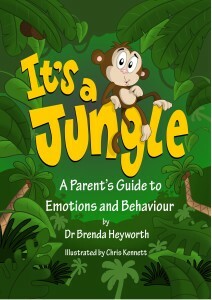 One method which is outlined by child psychiatrist Dr Brenda Heyworth in her book [ilink url=”http://www.itsajungle.com”]’Its a Jungle'[/ilink] is a simple rule involving the concept of ‘5 or 24’. This means that the child needs to go their room, for a few minutes (5) or a consequence of significance will be invoked for 24 hours. After the 5 minutes there is a ‘fresh start’. The child may want to stay in his or her room (fine) or might come out cranky (this is fine too) or may come out apologetic. If the behaviour is repeated then the 5mins is repeated. However if the child refuses then the ’24’ rule is invoked. Nowadays this could mean losing internet use, or mobile phone for 24 hours. For the younger child it may mean removing a favorite gadget or toy. This is well explained in her book and is highly recommended to parents of children who are providing extraordinary parenting challenges. In addition rewarding appropriate emotional responses with positive consequences is also extremely important. Catching them ‘being good’ encourages a child to take a more responsible emotional path. Helping children with anxiety is the bread and butter of child psychologists as it is the most common mental health disorder. The psychologist will assess the anxiety, establish some goals then work with the child and parent towards lessening this anxiety. Cognitive Behaviourial Therapy and managing worries, anxieties, phobias and improving resilience should be the goals of such therapy. This may requires a significant number of sessions and in Australia there is funding through medicare which will offset the cost of seeing a psychologist. This treatment works when the following occurs. In my experience these sessions are particularly useful if the child is keen for help, the parent and caregivers have a positive outlook and there is persistence and consistency. On the other hand if the child is incapable of engaging, or the parent is hoping that the psychologist is there to ‘fix it’ then this is unlikely to result in a positive outcome. A child psychiatrist is a doctor who has specialised in serious childhood mental health disorders. Although also being trained in psychological treatments the use of medication is sometimes needed where it is clear that the anxiety is so severe that there is little to be gained from simple psychological treatments. This is a major decision for any parent and so often it is a ‘last resort’. Many parents are ‘horrified’ at the thought of medication for their child which is not helped by the opinions of those around them who have little or no training in this area. The good news is that the medications that are now used are safe, very effective and often only need to be used for a short time (6 months or so). The class of medication that has the most research are called SSRIs which stands for selective seratonin re-uptake inhibitors. These medications were discovered in the mid 1980s and in children the most commonly used are fluoxetine and fluvoxamine. They increase seratonin which lessens anxiety and allow psychological treatment to be more effective. Having coordinated the care of such children here are a few tips that might help. The child psychologist needs to have a ‘connection’ with the child so he or she is keen to return. Medications, although a last resort, have been shown to be effective and safe.